This fantastic new book provides the mid-kyu and relatively weak player with all the skills and know-how to become strong in the fine art of game kibitz. With this book you will learn many of the Professional kibitz secrets, enabling you to confidently and authoritatively kibitz the games of strong dan and pro players. How to comment a game using chatter which, to the untrained eye, appears unrelated. Special section for what's on television, favourite beer and the weather outside. How to draw attention to your comments with skillful use of capital letters and excessive punctuation. How to demonstrate that you're much stronger than mid-kyu by predicting the co-ordinates of the next high-dan move without any explanation or qualification - and how to keep a low profile on those rare occasions when you're completely wrong! Maximizing your available kibitz space by using txt chat. omg its so kewl u wont be able 2 believe ur eyes!!! Imparting an air of mystical kyu power to your audience by boldly stating "ko" or "seki" when just a few stones have been played in an area by two battling dans. In the advanced section you will learn when to state that a move "is big" for even greater effect. Using kibitz to inform professional dan players that some of their moves are slow and that they should resign. How to make your statements appear knowledgeable while keeping them vague enough to abandon. People will respect your kyu authority when you clarify a tricky dan game with "b has some problems", "that move was brilliant" or "he walked into a trap" without any further explanation. Ten different ways to express your desire for a ko fight - without requiring any understanding of what a fight would mean or its significance! Get straight to the action with the "ko ko" kibitz chant! How to maintain your kibitz presence throughout a game. Most weak kibitzers stay weak because when they have nothing useful to say they remain quiet and leave the commentary to the most experienced players. Maintain a kibitz presence by typing something every few seconds and you'll ensure that you're always remembered and respected for your opinions. Includes free introduction to the Kibitz Teaching Ladder. Have your kibitzed games reviewed by stronger kibitzers. One of the fastest ways to make progress! Get Strong At Kibitz is available at all good bookshops priced £11.75. dnerra: Do we really want such shameless advertising on SL? I think this page should be replaced with a neutral description and a link to the publisher's blurb. The skill of timing when to start gloating how obvious it was that a tricky fight/semeai in a high dan game would turn out badly for white/black. If you start it too early, you won't get support from the watching crowd, not trusting your ingenious foresight. Start it too late, and someone might have said it before you. How to demonstrably explain the horrifying weakness of one or both of the players involved. This is especially important in high-level pro games, as other kibitzers might mistakenly trust the grade and success of the parties involved. No kibitzer can hope to acquire mastery in his field without a thorough understanding of these topics. Feel free to move this to /Discussion? if you think I am too harsh. jared: I have studied this book, and it never mentions one important topic relevant to English speakers in particular. English speaking kibitzers should make every effort to kibitz in broken Japanese. Even if the kibitzer completely misspells a Japanese word, the comment will be perceived by other viewers as all the more meaningful, despite being in a language they don't speak. mgoetze: Also, this book fails to mention a very important aspect of knowledgeable kibitzing - time kibitzes! There is a whole spectrum of skills to master here, from simply typing "TIME" without further comment when a 6dan uses up his fourth-last period of 30 seconds, to repeatedly asserting that a 7dan is sure to lose on time when he has only 80 seconds left for the next 6 moves. Dieter: A vote for a special chapter about the unique art of arguing who might be the best player on the server and who should play whom next. "After this game ...", "He's strong, but I wonder ...", "He got no chance against ..."
Joonas Tyystjarvi: this book also had nothing about punishing kibitz mistakes, which in my opinion is a huge flaw, since this is one of the fundamentals of kibitz. Being able to point out kibitz mistakes credibly can easily make one 2 stones stronger (in kibitzing, of course). Fwiffo: Does this book have a chapter on criticizing the score estimator? I'm well practiced at counting poorly myself, but I need to get stronger at mocking the SE which is critical topic for a kibitz book at this level. holosys: Good question - you have to remember that this book was written by ancient Chinese monks, long before the Internet was invented by Bill Gates in 1996 and bundled free with Windows 95. In those days the role of score estimator was given as punishment to any monk found guilty of unclean thoughts. During the game he would periodically shout out his own idea of the scores, while the assembled crowd would jeer and laugh at him. I suspect his role as estimator was left out of the book due to the distraction of constant heckling from smaller monks, who would frequently shout "Oi black, resign!" or "that move was small" before lying down on the floor and rolling around laughing. Cheyenne: Yes -- there are appendixes for the different Go servers, the book has sections that cover some of the more popular servers; the "Kibitzing Go Server", "I'm Going to Shout", "Yet Another Hollering Online Occasion", and "Diatribes Are SucH Noise". Fwiffo: I just got a copy of the second edition. There's a new section in the meta-kibitz chapter discussing the proper technique for mentioning Get Strong At Kibitz during game commentary. It was a topic I initially found quite challenging, but the book has really helped me conquer this technique. It's really the Nuclear Tesuji of kibitz. rubilia: This issue better should be dealt with distinctively at Get Strong at Referring to GetStrongAtKibitz?. WillerZ: I found that in the second edition they seem to have taken out a lot of the real-life kibitzing techniques, such as head shaking and the sharp intake of breath. I can't help but feel this is going to have a negative impact on the kibitzers of the future. NoGenius? : The guy who runs the go club I go to's favourite is "(that was) all you could do." Dave Special thanks to holosys for the most important addition to SL in some time. A "page of the month" candidate if ever there was one! *(224) petarixx [ 1k? ]: resignation or what? *(224) beijing [ 4d? ]: how old is Cho now? *(224) Uron [ 1k+]: finished? *(224) inte [ BC ]: yes. 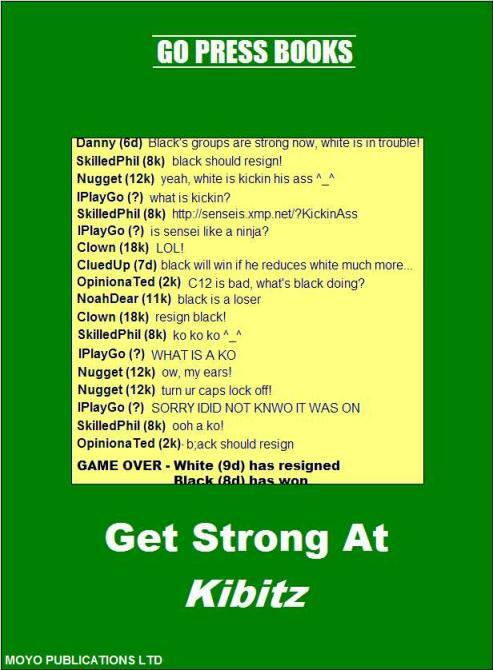 black resigned. *(224) beijing [ 4d? ]: which move is the losing move for b? inte: For what it's worth, white actually won that game. The 'White resigns' was the scribe's mistake. sloppy: A MUST. Still i would like to remind you of recent developments in the world of kibitz, which is international standardization (iso-kibitz / isk), will there be a second print?